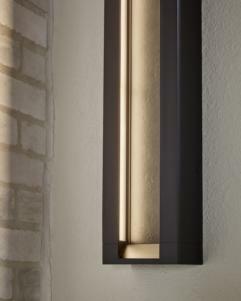 The Mattix outdoor lighting collection by Feiss combines exemplary engineering and beautiful modern design into wall sconces unlike any others. Vertically recessed LED light softly grazes across recessed inserts, unique with rich texture. The Oil Rubbed Bronze finish of the sleek outer frame is paired with a metal insert specially treated to create a heavily textured, organic pattern. The Painted Silver finish complements a clear glass insert deeply carved, vertically, to suggest a waterfall. While rated for outdoor lighting use, Mattix wall sconces can also be used for indoor applications, such as a media room where soft accent lighting versus task lighting is preferred. 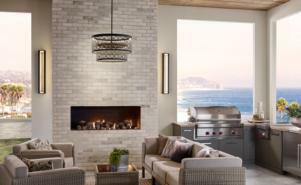 The line includes three, varying sizes of outdoor lighting wall sconces. ADA compliant. Lamping: (1) LED Integrated Array 20w Max. This advanced LED technology is carefully designed and selected to consist of the highest quality LED chipsets for superior performance and reliability.